I have graduate degrees in linguistics and creative writing from the University of Texas at Austin and have been a Working Scholar at Bread Loaf Writers’ Conference. I published one story in Beloit Fiction Journal, and, after life’s uncooperative interventions, am now just setting out to publish my work. Ada Pelonia is a writer from the Philippines. Her work has appeared or is forthcoming in Royal Rose Magazine, The Brown Orient, Pulp Poets Press, and elsewhere. You may check some of her works on adapelonia.weebly.com or her Twitter @_adawrites. lifts, squirts down again, breaks apart the vegetable. Beth McCallum is a Scottish writer, book blogger and candle maker. She is currently seeking representation for her debut novel, a sci-fi dystopian thriller. In her free time, she drinks tea, walks her dog and competitively plays board games. I don’t need it, though. James Roberts is a poet from Bradford. He’s spent the last two years working on longer writing projects about Catalonia and events in the Calais border zone, but also enjoys writing short, simple pieces. As well as Peeking Cat he has previously been published in Anti Heroin Chic and Route 57.
swerving past morningrise and the slow wolf patterns of his thoughts. ignoring his soon-to-be father eyes. across the aisles of his years. The long brides linger and then retreat. at the casualties which falter against the loneliness of the snow. Foy Timms is a poet and writer based in Reading, Berkshire. She also works as a Fundraiser in the Third Sector. Christopher John Eggett is a writer from Cambridgeshire trying to live close to water. 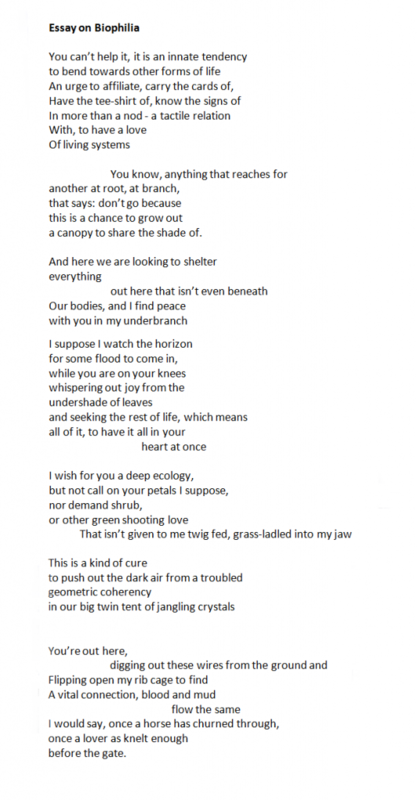 His work has appeared in Bone & Ink, Visual Verse and Burning House Press. He writes a literary newsletter, Etch To Their Own, every Friday and he’d love you to sign up to it. He tweets as @CJEggett – mostly about nice books he has bumped into on his doorstep. At Heaven’s Gate: This is The Story We Harvest. This Was How Your Mother too Traveled. In a Crimsoned Rosary . . .
/& Yet, this body too aches . . .
Abeiku Arhin Tsiwah is a Ghanaian Smartphone Enthusiast //& Content Critic. He’s the Poetry Editor at Lunaris Review (a Journal of Arts & the Literary, Nigeria) & the Creative Director at The Village Thinkers (a Creative Writing & Performing Arts Society, Ghana). The 2018 Shortlisted Poet for African Writers Awards has had his works anthologized/&[or] publicized in reputed literary volumes: EXPOUND, Whispers, NovelMasters, Kreative Diadem, Anansekrom, Gnosis Magazine, Tuck Magazine, The Liberian Literary Magazine, et cetera. the curtain slowly struggles up. to joke of football and cricket. Parkinson quotes an obscure poet. We paid £30 each a ticket. in the Business and Management section. someday we’ll all look and sound the same. A posthumous award dispels the monotony. Nobody else is wearing a hat like me. insignia seem to mean a lot. with her Masters in Psychology. I wore two-tone and danced to Al Capone. I’m still living in gangster time. Ray Miller is a Socialist, Aston Villa supporter and faithful husband. Life’s been a disappointment. The print issue for spring 2019 is now available! 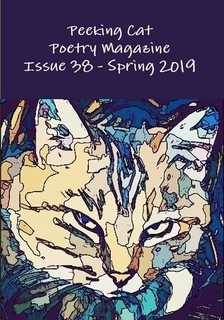 It features all of the poems and flash fiction posted on Peeking Cat from January to March 2019 – that’s 88 pages of great writing. Get your copy of the spring issue here!